A 20-franc Napoléon from the latter part of 1803, also known as An 12. N.B. the French Revolutionary calendar began in September with the Revolution and therefore each Revolutionary year falls into two Gregorian calendar years. The Napoléon is the colloquial term for a former French gold coin. The coins were minted (at various times) in denominations of 5, 10, 20, 40, 50, and 100 francs. This article focuses on the 20 franc coins issued during the reign of Napoléon Bonaparte, which are 21 mm in diameter, weigh 6.45 grams (gross weight) and, at 90% pure, contain 0.1867 troy ounces or 5.805 grams of pure gold. The coin was issued during the reign of Napoleon I and features his portrait on the obverse. The denomination (known as the Franc Germinal) continued in use through the 19th century and later French gold coins in the same denomination were generally referred to as "Napoléons". Earlier French gold coins are referred to as Louis (the name of eighteen French kings) or écu (an old French word for shield). 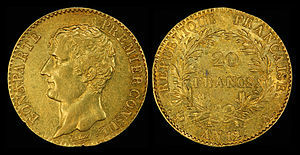 Gold Napoléons have historically proven more resilient than other gold coins to economic forces, such as after the Suez crisis when unlike other coins Napoléons did not weaken. 4.1 "The Euro before the Euro"
8 "Coins, a reflection of the political events of 1814–1815"
The coins were originally minted in two denominations, 20 and 40 francs for Napoléon Bonaparte. The 40-franc gold piece did not become popular. The 20 franc coins are 21 mm in diameter (about the size of a U.S. five cent piece or a Swiss 20 Rappen coin), weigh 6.45 grams (gross weight) and; at 90% pure, contain .1867 ounces or 5.805 grams of pure gold. The 40 franc coins are 26 mm in diameter, weigh 12.90 grams (gross weight) and; are 90% pure gold. They were issued during the reign of Napoleon I and feature his portrait, sometimes bare headed and other times wearing a laurel wreath (the ancient Roman symbol of imperial or military glory) and, depending upon the political status of France, the words on the front: either Bonaparte – Premier Consul (First Consul) or Napoléon Empereur (emperor). On the back: the legends read either "RÉPUBLIQUE FRANÇAISE" (French Republic) or after 1809, "EMPIRE FRANÇAIS" (French Empire). There was even a 20 and 40 Lire Napoleon minted under the auspices of the Kingdom of Italy, a client state. "Bonaparte First Consul" pieces of similar size, weight and fineness were struck at the Turin Mint. The obverse (L'Italie Délivrée à Marengo]) recounts that Italy was liberated  from Austria by Bonaparte at Marengo, Piedmont on 14 June 1800, whereat the French General Louis Desaix was killed. The reverse indicates the extent liberated lands, known as Gaul Subalpine, Eridania or Northern Italy. The type was created pursuant to the decree of the Gaul Subalpine government established after the Battle of Marengo and which existed from 16 June 1800, through 11 September 1802. 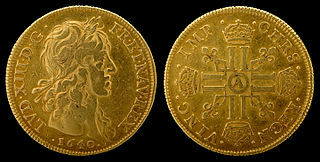 The coin continued in use through the 19th century and later French gold coins in the same denomination were generally referred to as "Napoleons". In particular the coins of Napoleon I were minted not only at the several French mints but also at the mints in Italian territories: Genoa, Turin (1803 to 1813), Rome (1812 to 1813), the Netherlands: Utrecht (1812 to 1813), and Swiss territories: Geneva, during the French occupation of these places. Although the mints came under French administration and minted French Empire coins, it was otherwise business as usual as the incumbent mint masters remained in their posts, for example: Sarwaas in Utrecht, Paroletti in Turin and Mazzio in Rome. Some coins of King Louis XVIII were minted in London in 1815. The English were supportive of the return of the French king to power after he was deposed by Napoleon in 1815, during the famous Hundred Days. The coins minted at London were purportedly authorized by Louis XVIII himself and were used to pay British troops occupying parts of North Western France. Some coins found their way to Paris and were considered counterfeits by the monetary authorities there and then. There was an exchange of diplomatic letters between France and England and the activity was stopped. The English artist who engraved the London dies, Thomas Wyon, Jr. (1792–1817), a highly accomplished artist, was insulted when his dies which were low relief based on the French struck coins and the original engravings of London born French engraver Pierre Joseph Tiolier (1763–1819) were considered inferior. Allegations also arose that the London Mint did not respect French law regarding fineness and tolerance with these coins and these facts have been offered for the early withdrawal of the coins from circulation. However, contemporaneous assays demonstrated adherence to the French law by the London minters. No coins were struck after 30 November 1815. Napoleon tried to unify Europe and almost succeeded, especially in terms of the coinage. The Napoleon coin was first authorized by a Monetary Ordinance of 28 March 1803 by the Premier Consul (First Consul) Napoleon Bonaparte. The 20 franc gold pieces which he authorized in 1803, became the model of all the coins of the Latin Monetary Union which circulated in Europe until 1914. The French coin carries the effigy, in profile, Napoleon, who would later become the French Emperor. The coins had the same value as the Louis, which bears the likeness of the pre-French Revolution King Louis XIV. For Napoleon, there were ostensibly seven types or varieties of the coins minted. In general the varieties differed in terms of obverse legend, reverse legends, portraiture, and calendaring system. For each variety, there was a new enabling statute or executive decree: 28 March 1803; 7 April 1803; 26 June 1804; 8 September 1805; 11 February 1807; 5 August 1807; and 22 October 1808. By extension, the term ‘‘Napoleon’’ is applied today to all the various types of 20 franc French gold pieces. "The Euro before the Euro"
Although the portraits and legends changed with the political changes in France, the denomination remained in usage until the First World War under what was known as the Latin Monetary Union, the "Euro before the Euro", so-to-speak. Switzerland had 20 Swiss franc pieces, Spain had 20 peseta coins, Italy had 20 lira pieces, Belgium had 20 Belgian franc coins, and Greece had 20 drachma coins, all of which circulated and were accepted throughout Europe. Only for political reasons did the United Kingdom and the German Empire refuse to follow this direction. Attempts were even taken to explore the unification of the European currency with the American dollar, which explains the extremely rare U.S. pattern coins carrying $4 marking on the face and 25 franc markings on the reverse. Reverse of the same coin 1803 Paris (AN XI indicates the 11th year after the French Revolution, or the latter part of 1803). A coin not often seen (58,262 were minted), this example exhibits Extra Fine details for a 206-year-old coin. The "A" denotes the Paris mint and the rooster denotes the mint master Charles-Pierre de l'Espine (1797–1821). Napoleon ordered coins struck in year 11 to be dated with Roman numerals fearing that Arabic numeral eleven would look like a two in Roman numerals and thus remind the public of the horrors of the Reign of Terror which occurred in the year 2. The coins bear the signature of the master engraver responsible for the engraving of the coins' dies. In later times the engraver used a symbol to identify himself. The coins also bear the mark (a symbol, letter, or monogram) denoting the particular French (or French controlled) mint which struck the coin. These mint marks often signal the rarity of the issue, for example the Napoleon 20 franc gold coin struck in 1809 at Paris and marked with the letter "A" had an issue of 687,508 coins; in the same year at the mint at Bordeaux, marked with the letter "K" only 2,534 coins were struck; while the mint at Lille, marked with a "W" struck 16,911 coins. Over the years there were some twenty-three French mints not only in France but also in annexed or occupied countries, including Italy, Switzerland and the Netherlands. Droz, Jean-Pierre (1746–1823), was perhaps the most skillful and certainly the most famous engraver and medallist of his day. Born in La-Chaux-de-Fonds, Switzerland, Droz studied in Paris and won acclaim with his fine pattern piece known as the Écu de Calonne after the French finance minister. This coin was struck with an edge inscription using a six-segmented collar (virole brisée) of Droz’ own invention at the Paris Mint. After a brief tenure at Matthew Boulton's Birmingham (Soho) Mint, Droz returned to France and in 1799 was appointed Keeper of the Coins and Medals at the Paris Mint, which post he held throughout the Napoleonic era. Meanwhile, he was much in demand by other governments as a consultant. He struck patterns for Spain, the United States and his native Neuchâtel among others. In French coinage, the effigy of Napoleon as engraved by him appears both on the 20 and 40 franc gold pieces from 1804 through 1814. Droz was also responsible for the pattern of the 5 francs of the "Hundred Days" in 1815. Among his medallic work, the coronation medals for Napoleon in 1804 ("Medal Celebrating the Coronation of Napoleon I by Pope Pius VII at Notre Dame Cathedral in Paris") and several medals and jetons for the Bank of France are the most noteworthy. Tiolier, Pierre Joseph (1763–1819), born in London, was appointed the engraver-general of the Paris Mint from 1803 to 1816. Tiolier engraved the patterns for the Bonaparte-First Consul coins. Tiolier was trained by his brother-in-law, the notable, Benjamin Duvivier. Many improvements of the coining machinery took place during Tiolier's tenure at the mint. His many medals and coins attest to his high skill. Tiolier's full signature appears on the dies he cut while coins bearing a "Tr" were from dies cut by others. Wyon, Jr., Thomas (1792–1817) was an English medallist who died at the early age of 25. In both 1810 and again in 1811, he won the Society of Arts gold medal for medal engraving. In only four years, from 1811 to 1815, he rose at the Royal Mint from a probationer to chief engraver. After a competition among artists who submitted designs: Nicholas Guy Antoine Brenet (1773-1846), André Galle (1761-1844), Romain-Vincent Jeuffroy (1749-1826), the design by the Swiss, Jean-Pierre Droz (1746-1823) was selected. The coins were the work of Joseph Pierre Tiolier (1763-1819), who was appointed Chief Engraver of the Paris Mint on 1 April 1803. It should be noted that there were no reducing machines at the time and the entirety of the engraver's work was completed by directly cutting into the die face with punches and gravers. In Year XI the government invested in a different method of minting pioneered by Jean-Pierre-Joseph Darcet (1777-1844). And in 1807, new minting equipment was introduced under the supervision of Philippe Joachim Gengembre (1764-1838), Inspector General of the Mints. This equipment, a Balancier Manuel (screw press) included a full ring (closed collar), produced slightly reduced reliefs. The general appearance of the coins is thus slightly modified compared to the coins struck by the prior methods. In accordance with the Concordat with Pope Pius VII (1742-1823), signed 15 July 1801, a decree put an end to the revolutionary calendar. On 17 Brumaire Year 14 (8 November 1805) the Minister of Finance announced the 1 January 1806, return to the Gregorian calendar which had been outlawed in October 1793. Slight modifications in the portrait make it possible to distinguish the 1807 type from the preceding 1806 type; in particular, the variation is in the space between the rim and the top of the head. The 1807 issues are remarkable because the design was decided during Napoleon's absence. When he returned to Paris he was surprised to discover the new coins which were the result of the engraver's diligence. This is also considered a transitional issue, that is a coin struck after an official series ends, or before an official series starts. It can also refer to a coin struck with either the obverse or the reverse of a discontinued or upcoming series. These coins are a transitional issue because they were minted just before the 1807/08 issues (with laurel crown). The term "tête de nègre" sometimes used for these coins is a colloquial descriptor applied because of the frizzy appearance of Napoleon's hair as that of an African man. A decree was announced by the Ministry of Finance on 5 August 1807, specifying the addition of a laurel wreath to the bust of Napoleon symbolizing the military victories of the Emperor. The decree of 22 October 1808, specified that for coins issued after 1 January 1809, the legend ―French Republic‖ would be replaced by ―French Empire. 1813CL- Tiolier was responsible for the dies for the Napoleonic coinage of Genoa (15 November 1811 through 1814). 1813Flag- the coining of French coins at Utrecht began on 16 November 1812 and did not continue beyond 1813. 1815 – the beading for the 1815 issue consists of 100 beads rather than the 103 beads used from 1809 to 1814. The 1815 coins show a greater distance between the eyebrows and the points of the "N" in Napoleon which are 2.4 mm for 1815 compared to 1.5 mm for earlier strikes. It is unlikely that at the time of the Emperor's return, Tiolier's original 20 francs dies had been preserved and thus, the dies must have been re-cut for the Hundred Days (21 March 1815 through 14 July 1815). The 1815 issue constitutes a discrete variety and the dies, signed Tr, were cut by Droz. 1815R (London) was struck in a lower relief, therefore, examples are difficult to find in better quality, yielding what is known as "condition rarities". On the obverse, the portrait is unsigned by the engraver, Wyon. On the edge, the word "SALVUM" appears to begin with the letter "Z" and the word "FAC" is not separated by a dot from the word "REGEM." On the reverse, the date is flanked by a fleur de lye, which was not a mark of any mint director, and the letter "R" which was not assigned to any French mint. The issue was considered counterfeit at the time of issue; however, it was authorized by Louis XVIII, in exile, and used for the payment of British troops serving in France. Between 1802 and 1814 millions of coins were struck and they circulated heavily. The average daily wage in 1805 was 1.50₣ (US 27¢). The coins carry mottos on the edges. Irregularities of the rims are acceptable and are not considered defects as they were caused by shifts of the coining collar and are characteristic of the edge lettering process. The edge letters are not sharp. There may be adjustment marks on the rims as well. The die axis was not well fixed and oscillates between 5 and 7 o’clock (as illustrated in the above photo of the An IX coin). "Coins, a reflection of the political events of 1814–1815"
In 1814 when Louis XVIII was restored to the throne of France (the Restoration), France changed its flag. Its coins, however, were merely modified to carry the king's portrait. There was a possibility that in modifying the coinage, Louis XVIII could have broken the reforms of the Revolution and returned to the duodecimal system and the livres of the Old Regime. But the new coins were struck with the same weight and fineness envisaged by Napoleon in the law of the 7 Germinal year XI, with one effigy (Louis XVIII) replacing another (Napoleon I). All issues are 90% fine gold, have a nominal net weight of 6.45 grams and, have a diameter of 21 mm. 1814 to 1815 5,634,709 Louis XVIII Roi de France (King of France) Pièce de 20 Francs DOMINE SALVUM FAC REGEM (God Save the King) Auguste-François Michaut Uniformed bust – Some pieces were struck in London and are marked with an "R"
^ Brendan Brown The Flight of International Capital: A Contemporary History 1136103007 2013 Page 229 "But now the German surplus had shrunk in line with a general worsening of West European nations' balance of payments in the immediate aftermath of Suez. Into early 1957, gold coin prices generally weakened except for Napoléons." ^ Requard, G., The Currency of France, Selections from the Numismatist, Modern Foreign Currency, Whitman Publishing Company, Racine, Wis., 1961, pp. 155–61 at p. 158. ^ Bordeux, Paul, Pièces de 20 Francs de Louis XVIII Frappée à Londres en 1815, Revue belge de numismatique, Brussels (1904). ^ Dyer, G.P., L’Atelier de Londres et la Frappe de Louis d’Or en 1815,Revue numismatique (française) 6e série, XVIII, Paris (1976), pp. 136–141. ^ Dyer, G.P., « L'Atelier Royal de Londres et la Frappe de Louis d'Or en 1815 », Revue numismatique (française) 6e serie, XVIII (1976), pp. 136–141. ^ Pond, S., Napoleon Emperor of the French Republic, Selections from the Numismatist, Modern Foreign Currency, Whitman Publishing Company, Racine, Wis., 1961, pp. 161-66 at p. 161. ^ Nantes Rend Hommage à Philippe Gengembre, Inspecteur Général des Monnaies sous l’Empire, Bulletin Numismatique Nr. 74, CGB-CGF, Paris, Février, 2010, pp.14-15. ^ Desrousseax, Stéphane,«La monnaie, reflet des événements politiques de 1814–1815», CGB Bulletin Numismatique,N° 64, Paris, (Jul. 2007),p.24. Château de Malmaison is a French château near the western bank of the Seine about 15 kilometres (9.3 mi) west of the centre of Paris in Rueil-Malmaison. The Louis d'or [lwi dɔʁ] is any number of French coins first introduced by Louis XIII in 1640. The name derives from the depiction of the portrait of King Louis on one side of the coin; the French royal coat of arms is on the reverse. The coin was replaced by the French franc at the time of the revolution and later the similarly valued Napoleon. The actual value of the coins fluctuated according to monetary and fiscal policy, but in 1726 the value was stabilized. 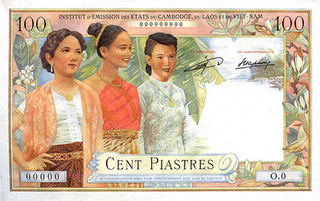 The piastre de commerce was the currency of French Indochina between 1885 and 1952. It was subdivided into 100 cent, each of 5 sapèque. The Swiss franc has been the currency of Liechtenstein since 1920. The Swiss franc is legal tender since Liechtenstein is in a customs and monetary union with Switzerland. 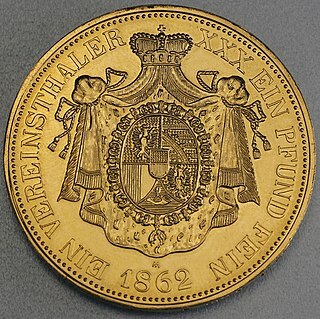 The 1980 treaty between Switzerland and Liechtenstein allows Liechtenstein to mint limited amounts of Swiss francs with a Liechtenstein inscription, but only in the form of commemorative coins, and they are not allowed to issue banknotes. Auguste-François Michaut, was born in 1786 Paris and died in 1879 Versailles. He was a coin engraver of France and Holland, a medallist and sculptor. Romain-Vincent Jeuffroy was a French gemstone engraver and medalist. He was active before and during the French Revolution and the First French Empire, and made many medals for Napoleon.